This one looked a potentially more exciting clash than many gave it credit for. 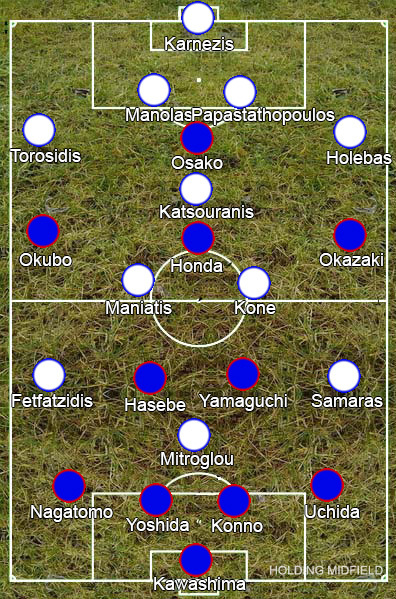 Japan are a decent side of technical players that should flourish in the coming years and Greece, although still primarily defensive, have a worse reputation due to Euro 2004’s less than exciting style than their team actually plays, with both full-backs charging forward and Panagiotis Kone is a particularly attacking choice for the midfield trio, while both teams could have really done with a win to keep their hopes of getting through the group alive after losses to Ivory Coast and Colombia in their opening games. Sometimes it is right to pessimistic though. This was one of those times. Japan started well, playing neat passing moves and getting their full-backs forward, while the Greeks looked energetic in attack, but Kostas Katsouranis’ dismissal killed every little thing the game had. A loss would have all but knocked them out of the tournament, so the Greeks went absurdly defensive, sitting deep and hoping for a set-piece. Japan passed and passed but never looked like scoring, with Greece arguably closer to edging it. Horrible. Just horrible. I hope they both get knocked out.